1. Sift the flour coconut sugar and salt into a mixing bowl then add the cubed dairy free spread. Add the chopped rosemary and mix together. 3. Once chilled, take out and place onto a floured surface and roll out to ¼ inch thick. 4. Place the rolled pastry in a greased tart tin chopping off any excess around the edges then using a fork prod the tart base several times and set aside ready for the filling. 1. Chop the butternut squash into large squares and lightly boil for 20 minutes until softened. 2. In a separate pan gently heat the spices for around 1 minute then add a glug of olive oil and fry the onion. 3. Drain the butternut and add to the pan with the onions and spices. Using a fork roughly mash the butternut, still leaving chunks here and there then take off the heat and leave to one side. 4. Add the filling to the pastry and place in the oven for 45-50 minutes until pastry is golden. 5. Peel the larger leaves off the brussels sprouts and scatter over the top of the tart, place back in the oven for around 5 minutes to crispen. 6. 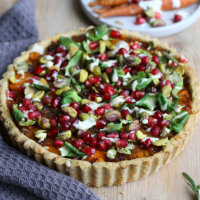 Take the tart out of the oven and scatter the pomegranate and pistachios. 7. Mix the dressing together in a small dish and drizzle over just before serving.